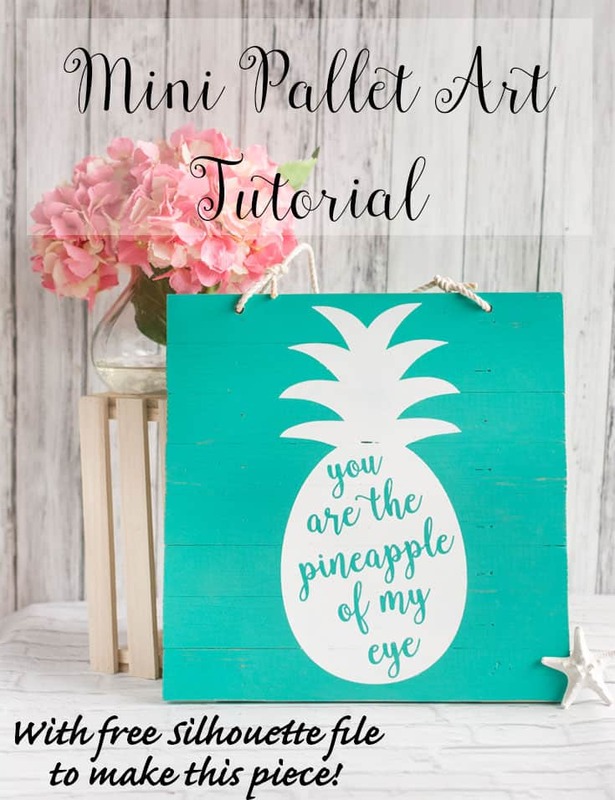 Mini Pallet Art Tutorial – You are the Pineapple of my Eye – with free Silhouette file! 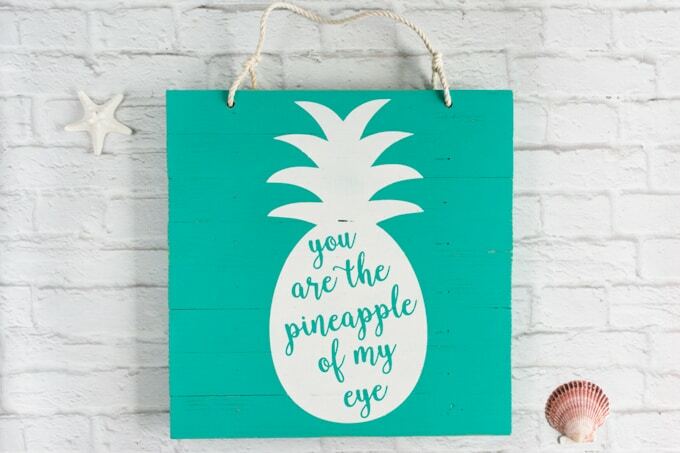 It’s no secret that I love beachy decor. I feel like one in three projects I write a tutorial for has at least a slight nautical vibe! I was trying to stay away from too many beachy things while everyone else in the Northern Hemisphere was “enjoying” winter, but since spring is in sight I decided to launch back into the beachy tutorials. 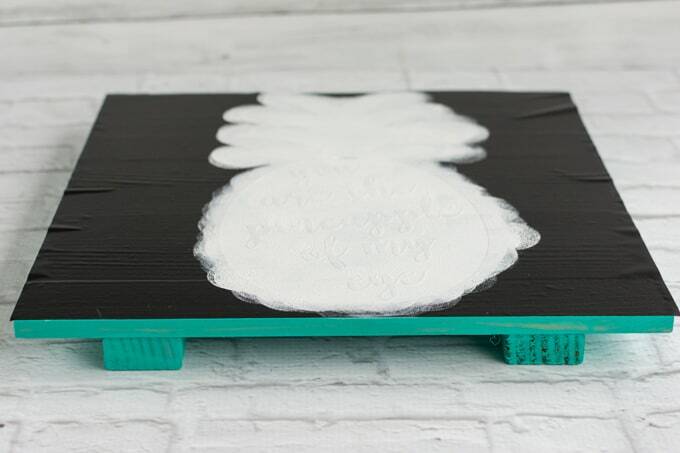 Today I’m sharing how to make DIY mini pallet art where not only the ‘art’ is DIY, but also the mini pallet! 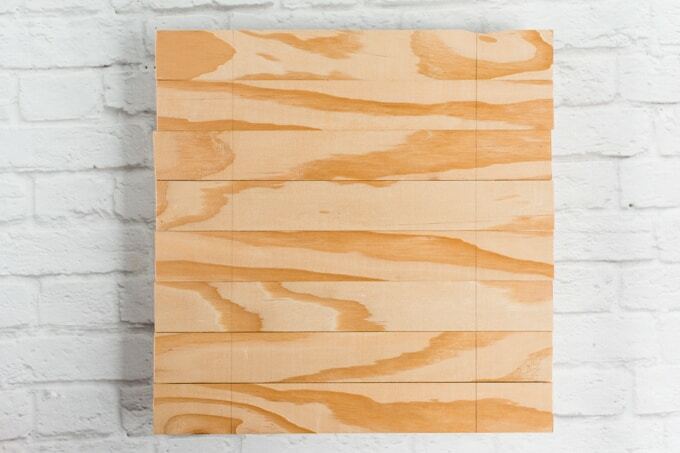 That’s right, this tutorial shows you how to make your own pallet-style panel to decorate. I also included a Silhouette Studio file you can use to make a vinyl stencil and create the exact piece of pallet art shown! This DIY mini pallet art tutorial is a bit more involved than most of the crafting tutorials I share, so you can always look for an unfinished wood pallet panel at a local craft store or online then decorate it with the Silhouette stencil. This 11×11 unfinished pallet is the best fit I’ve seen on Amazon, but you will need to scale the stencil slightly. 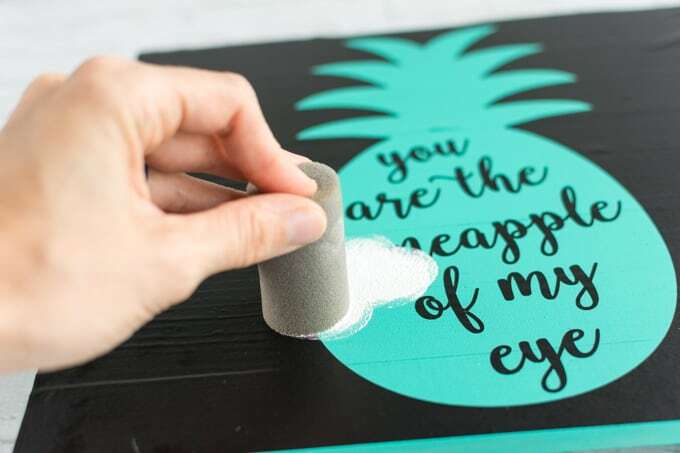 Of course, you can also just paint on a plain board – don’t let a lack of building skills or desire to purchase a pre-fab mini pallet stop you from making this fun project! One 8 foot pine “lattice” strip. You may also see something called a “lathe” strip. This can work, too, but the lattice is a bit thicker. It will be almost 1/4″ thick and about 1.5″ wide. 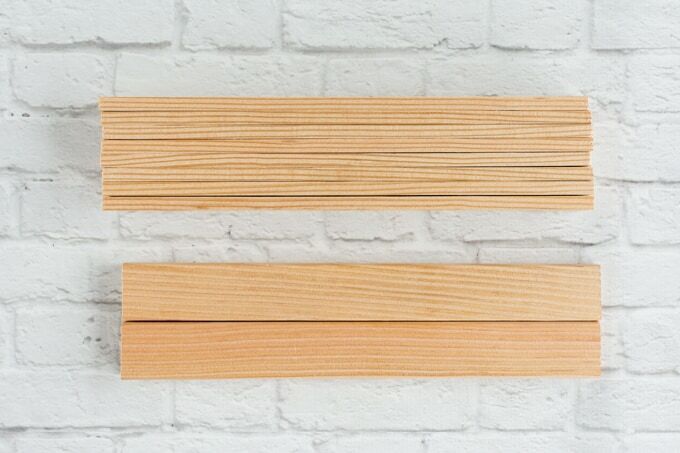 This board will form the slats of your ‘pallet’ and you need a full 8 feet per pallet. 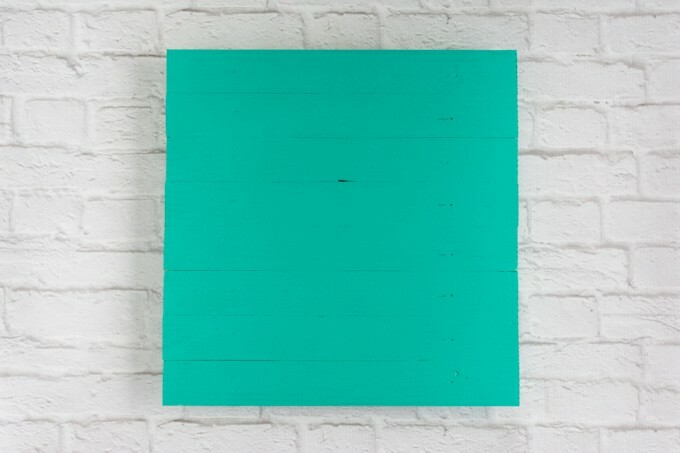 One 1″x2″ board. Try to look for one labeled “clear pine.” Clear pine means it’s pine but doesn’t have lots of knots and holes. This one will probably be sold in 4, 6, and 8 foot lengths. You only need 2′ per pallet, so you can get 2 pallets from a 4′ board! This board forms the two back pieces that hold the slats together. Wood glue. I like Titebond Original for this project, but Gorilla also makes a nice wood glue. A high-powered staple gun with staples or brads, optional but highly recommended (I prefer brads for this project). The wood glue should be strong enough to hold the pallet together on it’s own, but it’s always best to have a mechanical bond, too. You can also use finished nails with a hammer and drive them in yourself. Rope or twine. This mini pallet is not designed to stand freely on it’s own. 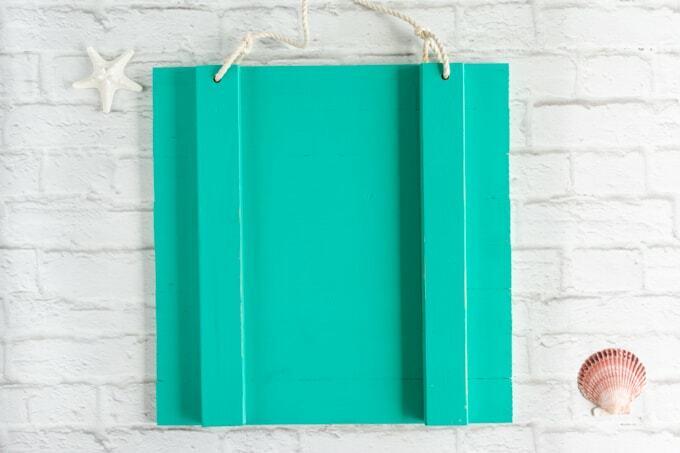 You can place it in an easel or lean it up against something, but if you’d like it to hang you’ll need to add some rope. You can either drill two holes and tie the rope in place or staple it to the pallet’s back. If you plan to make holes, you’ll obviously also need a drill and drill bit sized to work with your rope. A saw. Well…technically you could get away without one. The hardware or home improvement store where you purchase your lumber will probably cut it for you, but they’ll most likely charge for the cuts. The cuts may not be super accurate and are likely to have rough edges, but you can probably get the boards cut at the store. My weapon of choice is a compound miter saw (this Hitachi is the one we have and it’s a workhorse! ), but you can also use a circular saw, hand saw, or even a band saw. You could also use a table saw, but you’d probably want a sled. 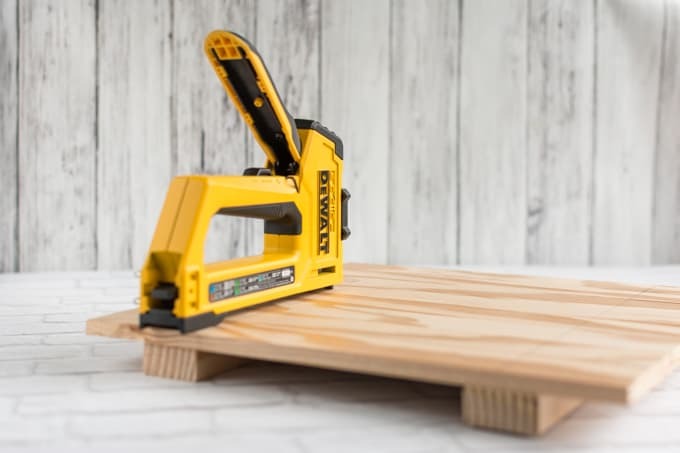 I’m not going to explain what that means here because it really isn’t the best solution and if you’re not already comfortable with a table saw I don’t recommend trying it. Table saws are scary! Sandpaper for any splinters or rough spots. You’ll probably want 100 grit or 120, at the finest. Safety equipment, including safety glasses, hearing protection (if you’re using a power saw), and a dust mask. Safety glasses are less than $10 and you can buy disposable dust masks. I do a lot of woodworking, so I have this awesome 3M half face respirator. It makes me feel cool and like I’m in some post-Apocolpytic video game world. 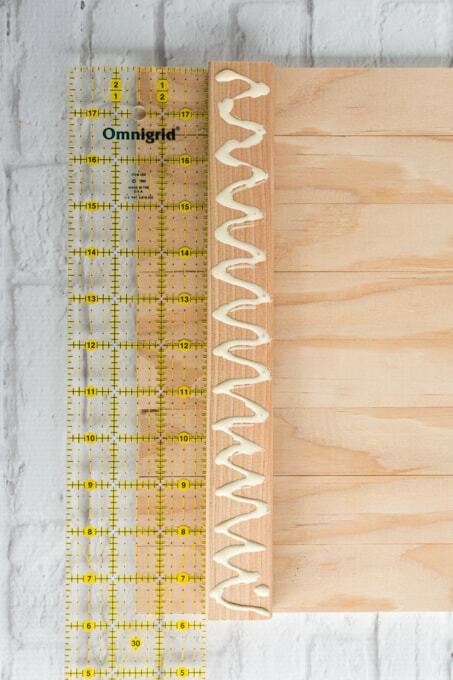 Quilting ruler or regular ruler. I like to use my 3″ quilting ruler because it makes placing everything so much easier. You’ll see what I mean! 1. Cut the lattice strip into 8 11.75″ sections. You can’t make them a full 12″, even though it claims to be an 8 foot board because lumber is basically never the length it says it is. Additionally, each saw cut will take up about 1/8″ of the board. 2. Cut two 11.75″ sections of the 1×2. 3. Use your sand paper to clean up any major splinters created by sawing, if necessary. 4. 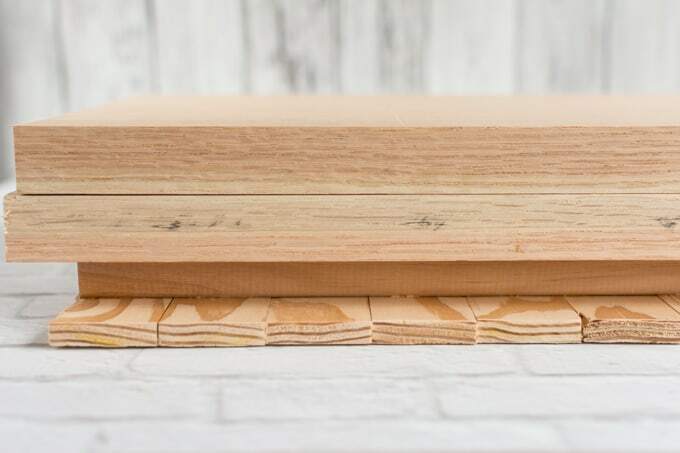 Place your thinner boards side by side to form the body of your pallet. Make sure to put the “nicer” side down because the side that’s currently down will be the front of your finished art panel! It doesn’t matter if all the ends don’t line up perfectly – real pallets are far from perfect. 5. Grab your quilting ruler and glue. It’s time to get building! 5. 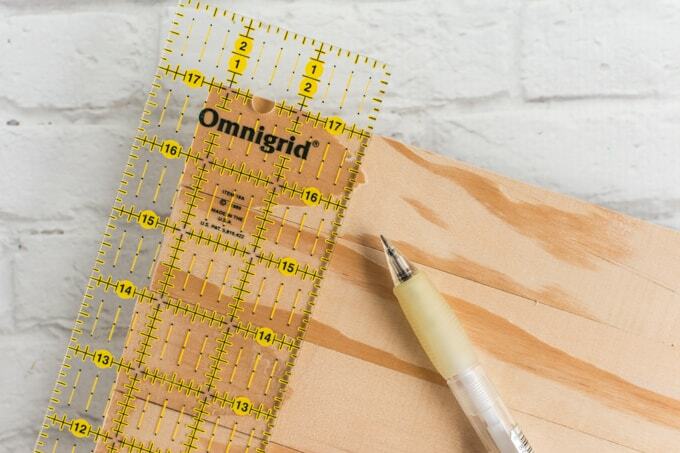 Place your quilting ruler so one edge runs 1.5″ in from one edge of your prepared boards. Place it “across the tracks” so it rests across all the boards, not along the length of one. 7. Hold your ruler in place with one hand and position the board with the other. Press down carefully (if you press too quickly the board will slide around on the glue) and then wipe up any excess glue with a paper towel. 8. Repeat steps 5, 6, & 7 for the other side of your mini pallet. 9. Grab your weights and carefully place them on your pallet so they’re resting on the pieces you just glued. Press down gently but firmly, then wipe up any additional glue you see (that you can access without bumping everything and knocking it out of place). 10. Allow your project to sit like this for 20-30 minutes, or whatever the directed ‘clamping time’ says on your glue. 11. Remove the weights and flip the pallet over. It should be able to hold together at this point, but the glue isn’t fully cured so be careful. 12. Use your ruler to draw a light pencil line on the front that roughly marks the center of the back support piece you just glued in place. Repeat for the other support piece. You’ll just need to eyeball this – it doesn’t have to be super exact. Erasing pencil off wood can be surprisingly difficult, so draw the line as lightly as possible. 13. 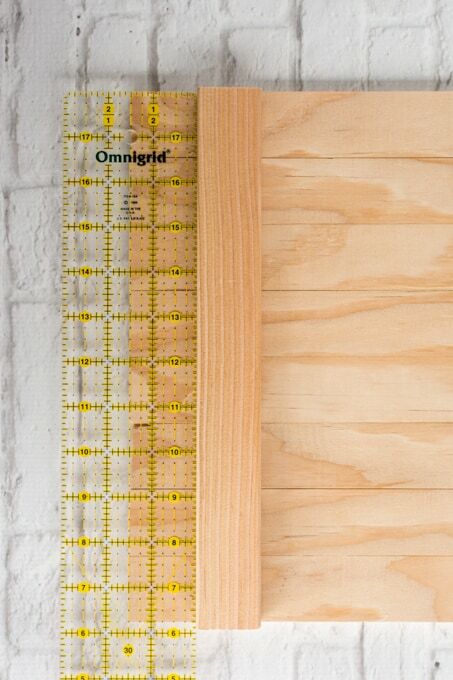 Use your staple gun to place a staple or brad along this pencil line in the center of each slat. Once again, this doesn’t have to be extremely exact – just make sure the brad actually goes into the 1×2 instead of sticking out the side. If you’re using finished nails and a hammer, place your nails in the center of each slat along this pencil line, too. 14. If you want to drill a hole for hanging the pallet art, this is the best time. Drill your hole along this center line and about 1/2″ down from the top on each side. Just make sure you’re not going to drill through your staple or nail! You can also drill later, but you risk messing up your paint. 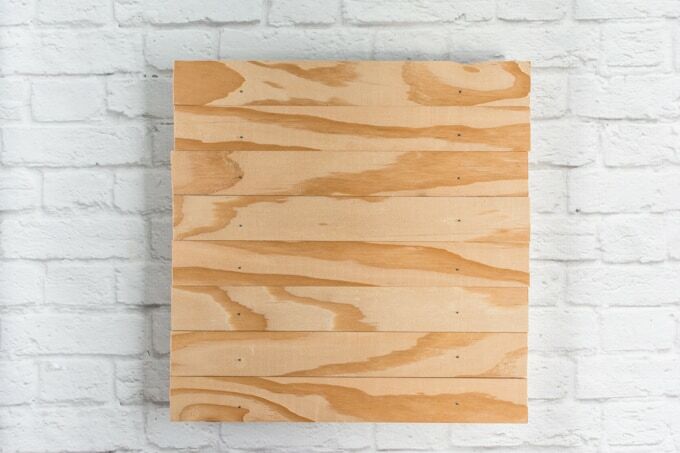 At this point, you can do whatever you’d like with your pallet art panel. You can paint it, stain it, glue things to it – the choice is yours! Hold off on adding the rope or twine until after it’s painted, though, so you don’t end up accidentally painting the rope! The Silhouette file is sized specially for a pallet panel made using my tutorial, but it can be resized to fit other pallet blanks. 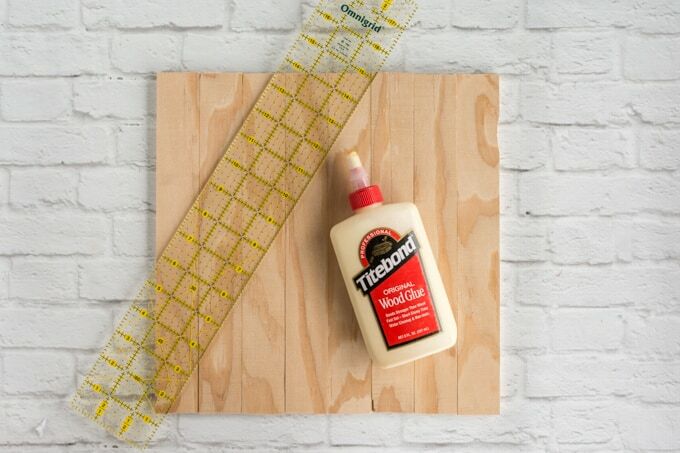 You can also use it on a plain board, so you don’t even have to make/buy a mini pallet. The file is on Google Drive and is linked below. A Silhouette machine & software. Sorry, y’all, but it’s necessary for this. If you’ve been thinking about getting one but haven’t yet, I highly recommend it. I use mine almost every day, and have for over two years. 1 square foot of repositionable vinyl. You can also try using contact paper, but you’ll need to be very careful painting because the paint is more likely to get under it. I use this roll of vinyl because it works well and is a good price. A vinyl weeding tool or sharp tweezers. Transfer paper or contact paper for transfer. A card or squeegee for transferring the vinyl. I use my craft store craft club membership card. Gift cards also work well, but bank/credit cards aren’t my first choice because the raised lettering can put dents in vinyl and wood. 2 colors of paint. I used a tropical teal and white. As I wrote in my tutorial on how to paint a glass jar, I prefer interior latex paint samples to craft paint. It costs less by volume and comes in so many colors! That having been said, I actually tend to do my first layer of stenciling with craft paint because it’s thicker, but I’ve done similar projects with all latex. I’ve seen people say you can’t use latex with stencils, but I have never had a problem with the paint peeling when I remove the stencil. Paint brushes. I use a small foam roller for nice, even color with my base coat, but you can use a regular brush or foam brushes. I also use a small foam brush for hard to reach areas (the sides of those 1x2s on the back!). You’ll also need a foam pounce/stencil brush. 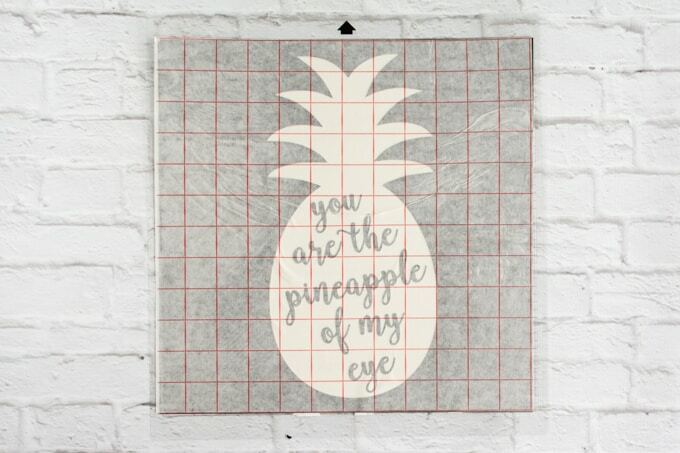 And, of course, your free “pineapple of my eye” stencil file! 1. Paint your pallet with your base color. In the example, that’s the tropical teal. This will probably take at least two passes if you want to paint the font and back, and you may want to apply a second coat (depending on your coverage). 3. 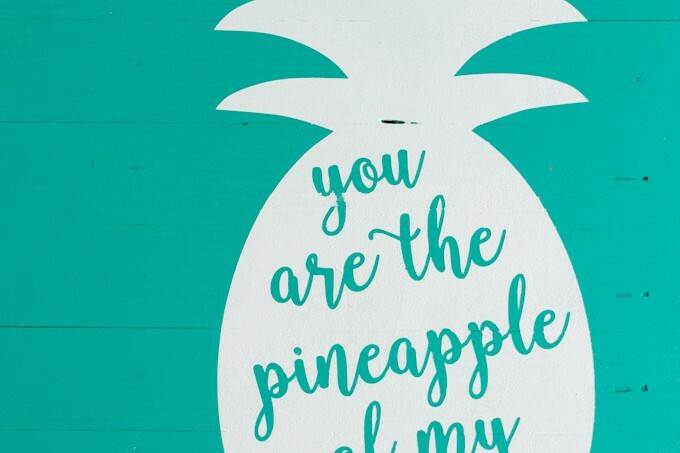 Cut out the pineapple design with your Silhouette. Try to keep it in the center of the 12″ piece of vinyl – you’ll need that extra coverage to help keep white paint off your pallet. 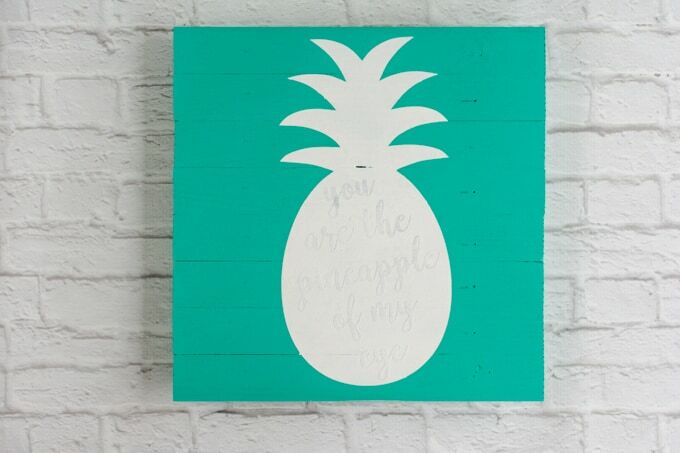 Here’s the link to the pineapple stencil file on Google Drive in case you missed it above. 5. Lay your transfer paper or contact paper over the weeded stencil and run your card across the surface to help the transfer medium stick. If you’ve ever used vinyl before, you’re familiar with this process. 6. Carefully lift the transfer tape to remove the stencil from its backing. Take it slow and stop to rub areas with you card, as needed, to get all the pieces off. 7. Position the stencil on your mini pallet, lay it in place, then repeat the process of going over it with your card to help the vinyl stick to the wood. Press firmly and evenly as you pass your card over the surface. This is actually called “burnishing,” if you’re into technical terms. 8. 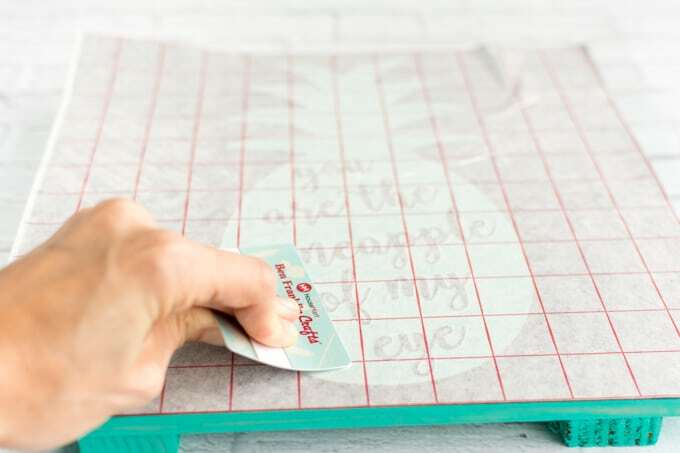 Carefully and slowly peel the transfer tape off the stencil, holding the stencil in place with your card, as needed, to ensure it stays on the wood. Go over all of it again with your card, pressing it in place. Make sure to really press down along the edges of the design and over the text, but don’t scrape the text off or move it out of place! Don’t worry, it sounds way tricker than it really is. 9. You’re ready to get painting again! Use your white paint and a foam pounce to “pounce” the paint on. Basically you dab it on with vertical bounces instead of broad strokes. This helps keep the paint from leaking under the stencil’s edges. 10. Allow the paint to dry then add a second coat. I typically carefully use a brush or roller for the second coat for a smoother appearance. 11. Allow the paint to dry fully, at least several hours, then carefully peel off the stencil. You may need to use tweezers to grab all of the letters. You can also use your hair dryer on “cold” to speed the process along. I don’t recommend using a heated setting, though, because it can do funny things to the vinyl. 12. Voila! 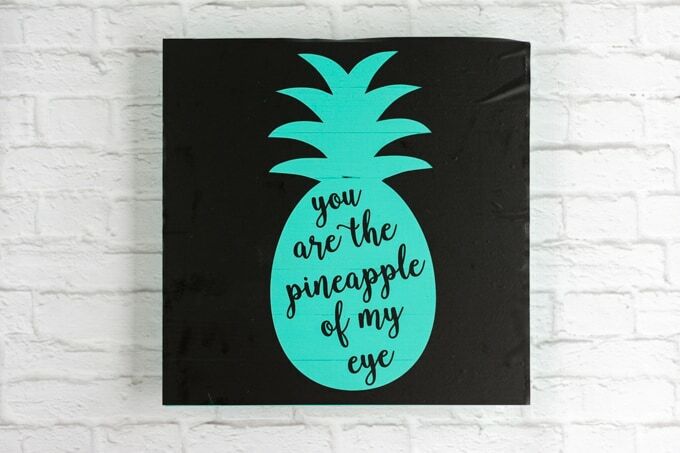 Admire your new piece of art! There may be a few spots where the paint leaked – that’s okay. You can leave them or touch them up with a small brush and a little extra paint. 13. If desired, carefully use a small piece of sandpaper to weather the panel. Sand some paint off, especially along edges and raised areas, to give it an authentically loved feel. 14. Wipe the art down with a paper towel to remove sanded paint residue and treat with a matte spray clear coat, if desired. 15. Tie your rope or twine in place. 16. 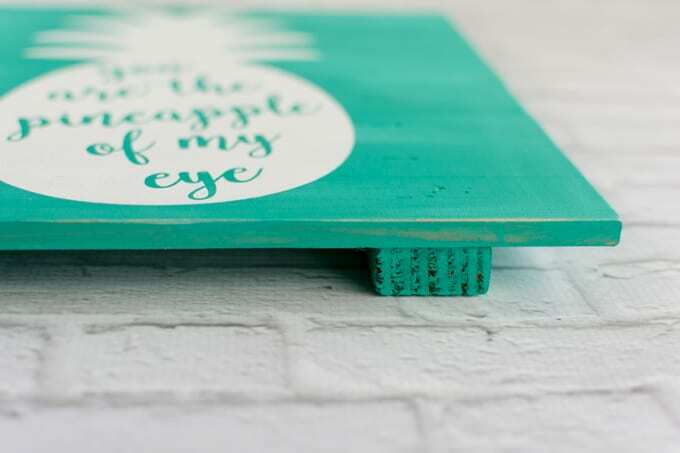 Hang your awesome mini pallet art, step back, and admire! I know it’s a bit more involved than many projects I’ve shared, but if you have the inclination to make it I say go for it! It’s a lovely piece and it isn’t actually that difficult to create. I also have several other pallets made and ready to decorate, but I can’t decide what to put on them! 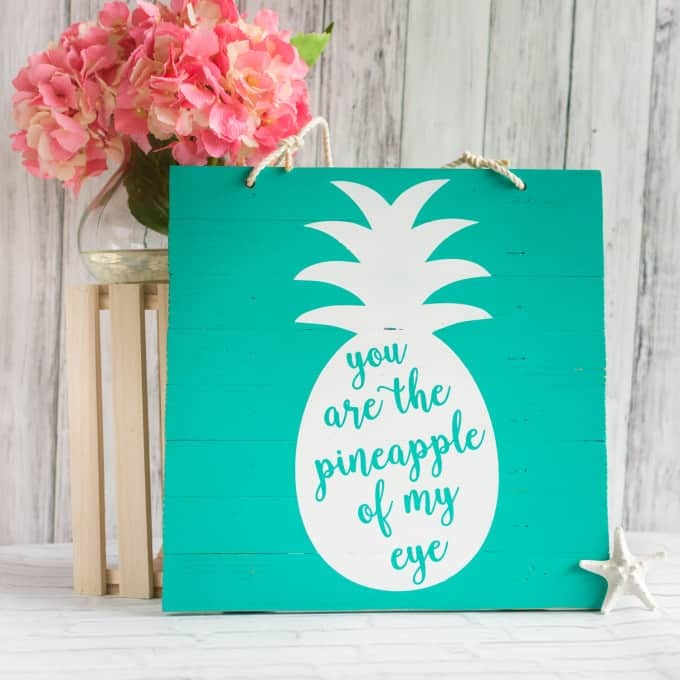 What sort of image or phrase would you like to see on a piece of pallet art? How will you decorate your own DIY mini pallet? And, really importantly, would you enjoy seeing more involved tutorials like this one in the future? Super cute Natasha 🙂 Really lovely idea and I love that shade of turquoise blue! Thank you! That sign actually already has a new home in someone else’s house! I need to make another for myself. This is really lovely! Thanks for the detailed instructions with lovely pics! 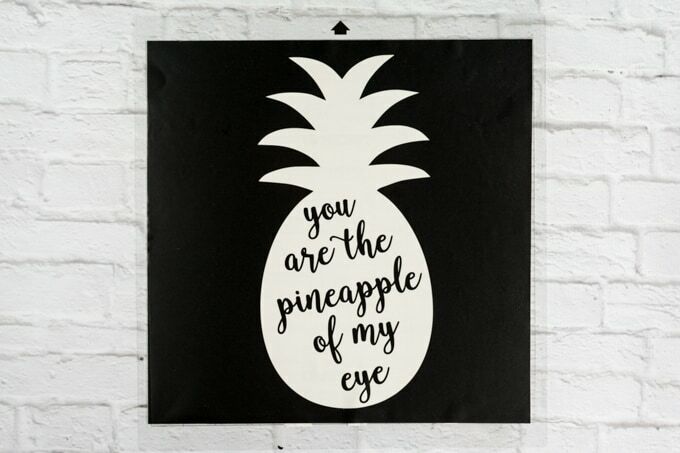 I love the pineapple design!